We have a Winner for the Sunday Blog Hop! I have a winner to announce from our "Celebrate" blog hop. The lucky winner is Vicki from Pink Posh Cards. She was chosen from Jen's blog, Pieces of Me. Please contact Cassie (cassandratrask@yahoo.com) to claim your $25 gift card to use toward digital images! Have a wonderful day of stamping! Welcome to our monthly Sunday Blog Hop! There will be a prize each month! WINNER: The winner will be randomly chosen from comments received on DT member blogs. The winner will be announced on the CDS blog Thursday, June 21st. Have fun hopping, my friends, and be sure to leave comments along the way! You could be the winner of the gift code! We have a winner for our May Blog Hop - Congratulations Natalie and her blog, Delightful Details. She was chosen from Jennifer's blog, My Cubby Crafts. WINNER: The winner will be randomly chosen from comments received on DT member blogs. The winner will be announced on the CDS blog Thursday, May 24th. Sunday Blog Hop -- We're Not Horsin' Around! WINNER: The winner will be randomly chosen from comments received on DT member blogs. The winner will be announced on the CDS blog Thursday, April 19th. We have a winner!! Congratulations to Tami B. of Tami's Craft Connection. 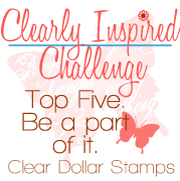 You are our winner of the Clear Dollar Stamps "Spring is in the Air" blog hop. Your name was chosen from Tameko's blog, Creating My Peace. Please contact Cassie (cassandratrask@yahoo.com) to claim your $25 gift code for digital images! WINNER: The winner will be randomly chosen from comments received on DT member blogs. The winner will be announced on the CDS blog Thursday, March 22nd. We have a winner! Congratulations Rhonda Miller from RHONDA'S PLACE TO SHARE. Your name was chosen from Linda's Blog, THE STAMPER'S TOUCH. Please contact Cassie at cassandratrask@yahoo.com to claim your $25 gift code to use on digital images! Sunday Blog Hop -- What's Black & White & Red all Over? WINNER: The winner will be randomly chosen from comments received on DT member blogs. The winner will be announced on the CDS blog Thursday, February 23rd. We have a winner! Congratulations, Debbie, of DEBBIE'S DASH OF THIS AND THAT! You're name was chosen from Jerusha's blog, I LOVE PAPER CRAFTING.